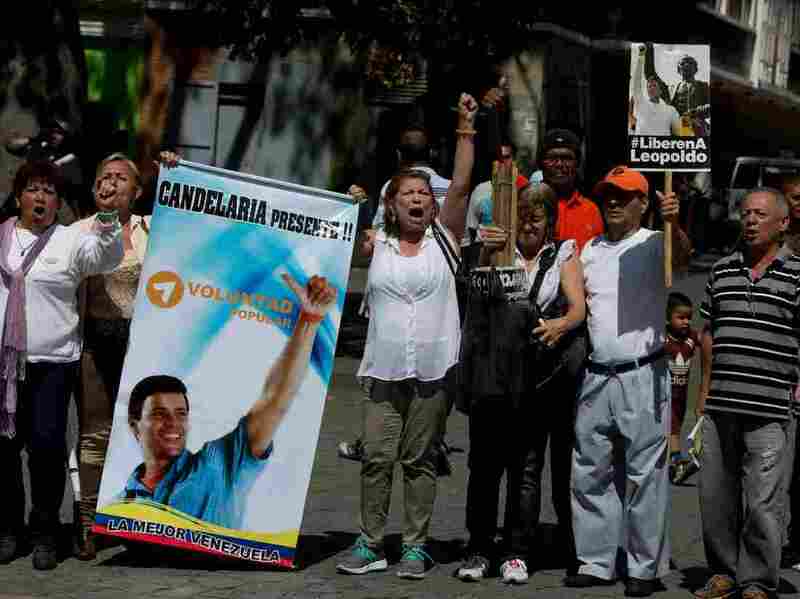 Winning Big, Venezuela's Opposition Now Plans Push For Prisoner Release : Parallels Venezuela's opposition won a landslide victory in Dec. 6 legislative elections, raising new hopes for the release of dozens of political prisoners — including opposition leader Leopoldo Lopez. Supporters of Venezuelan opposition leader Leopoldo Lopez shout "Freedom for Leopoldo" outside a court in Caracas in September. Lopez, Venezuela's best known political prisoner, was arrested and sentenced to nearly 14 years in prison after giving a speech at a demonstration last year. Venezuela's opposition won a landslide victory in legislative elections on Sunday that's seen as a political turning point, because the Socialist Party has controlled all branches of government for the past 16 years. Legal experts say Venezuela is holding about 80 political prisoners — mostly student activists and opposition politicians who took part in massive anti-government protests last year. The prisoners are not allowed to speak to journalists. But one detainee, who is being held at the government's intelligence headquarters in Caracas, agrees to talk by phone if I don't reveal his name. He claims to have been repeatedly beaten by guards. That's left him with a broken hand and two missing fingernails, but he has yet to see a doctor. Former detainees say they were also mistreated. Gerardo Resplendor, a graduate student in engineering who helped plan last year's protests, spent 14 months in jail, but says the first day was the most brutal. Resplendor says he and other handcuffed detainees were placed in large room dubbed "the soccer field." That's because guards treated the prisoners like soccer balls by kicking them around the room for the next hour. Resplendor was among 3,500 protesters arrested last year. Most were released for lack of evidence. Still, Resplendor stands accused of possession of explosives. Other activists face charges of terrorism and inciting violence that could mean lengthy prison terms. Daniel Wilkinson, who monitors Latin America for Human Rights Watch, says many of these charges are trumped up. "There's no independent judiciary left in the country," he says. "Instead, what you have are judges and prosecutors who fear that if they don't do what the government wants, they're going to lose their jobs and could even end up behind bars themselves." So how does Venezuela stack up against its Latin American neighbors? "I'd say it's second only to Cuba, when it comes to having a government that's willing and able to jail its critics and its opponents," Wilkinson says. A prime examples, he says, is opposition leader Leopoldo Lopez, Venezuela's best known political prisoner. After giving a speech during last year's demonstrations, Lopez was arrested and sentenced to nearly 14 years in prison — a decision that sparked international outrage. In October, the lead prosecutor in the Lopez case fled with his family to Miami, where he released a video claiming that the evidence used to convict Lopez was fabricated. Government officials refused to speak with NPR about political prisoners. But in the wake of the legislative elections, pressure to free them is growing. Once the new Congress convenes in January, opposition leaders say they will use their new powers to pass an amnesty law for political prisoners. Lilian Tintori, the wife of the jailed Lopez, told reporters that the government should take action even faster. "The election was a call for change, a call for freedom," she said. "We want all the political prisoners home by Christmas." But in a defiant speech on Tuesday, President Maduro said that if an amnesty bill reaches his desk, he will veto it. "They could send me a thousand amnesty bills," he said. "But the assassins of the people must be judged and they must pay."